(MIT NEWS – David L. Chandler) – Thermoelectric devices, which can generate power when one side of the device is a different temperature from the other, have been the subject of much research in recent years. Now, a team at MIT has come up with a novel way to convert temperature fluctuations into electrical power. Instead of requiring two different temperature inputs at the same time, the new system takes advantage of the swings in ambient temperature that occur during the day-night cycle. 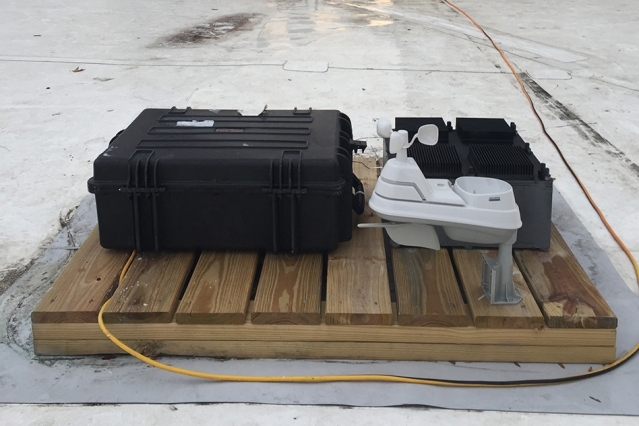 The team’s test device, which has been deployed on the roof of an MIT building for several months, was used to prove the principle behind their new energy-harvesting concept. The test device is the black box at right, behind a weather-monitoring system (white) and a set of test equipment to monitor the device’s performance (larger black case at left). The findings are being reported in the journal Nature Communications, in a paper by graduate student Anton Cottrill, Carbon P. Dubbs Professor of Chemical Engineering Michael Strano, and seven others in MIT’s Department of Chemical Engineering. While the power levels generated by the new system so far are modest, the advantage of the thermal resonator is that it does not need direct sunlight; it generates energy from ambient temperature changes, even in the shade. 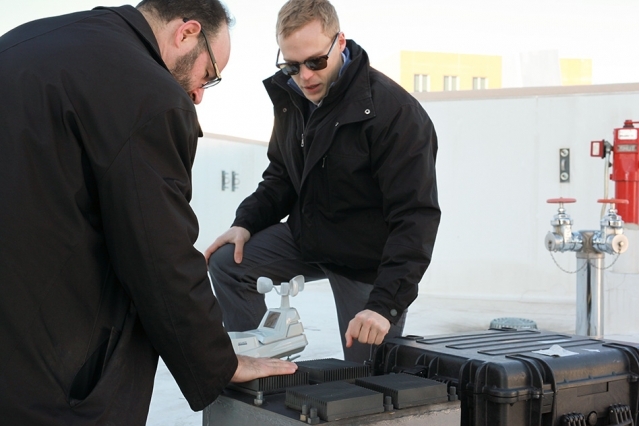 That means it is unaffected by short-term changes in cloud cover, wind conditions, or other environmental conditions, and can be located anywhere that’s convenient — even underneath a solar panel, in perpetual shadow, where it could even allow the solar panel to be more efficient by drawing away waste heat, the researchers say. The thermal resonator was shown to outperform an identically sized, commercial pyroelectric material — an established method for converting temperature fluctuations to electricity — by factor of more than three in terms of power per area, according to Cottrill. A sample of the material made to test the concept showed that, simply in response to a 10-degree-Celsius temperature difference between night and day, the tiny sample of material produced 350 millivolts of potential and 1.3 milliwatts of power — enough to power simple, small environmental sensors or communications systems. “The phase-change material stores the heat,” says Cottrill, the study’s lead author, “and the graphene gives you very fast conduction” when it comes time to use that heat to produce an electric current. Essentially, Strano explains, one side of the device captures heat, which then slowly radiates through to the other side. One side always lags behind the other as the system tries to reach equilibrium. This perpetual difference between the two sides can then be harvested through conventional thermoelectrics. The combination of the three materials — metal foam, graphene, and octadecane — makes it “the highest thermal effusivity material in the literature to date,” Strano says. 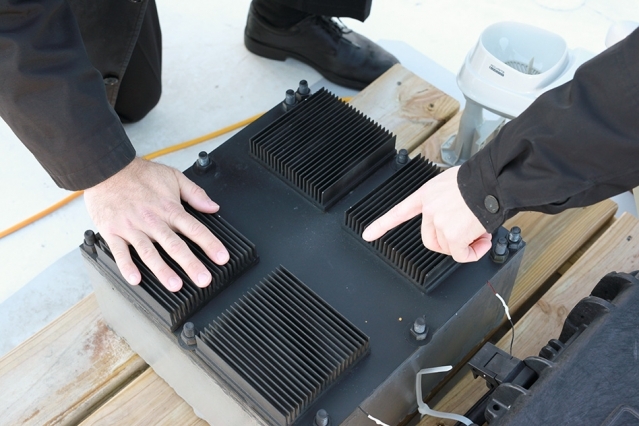 Close-up view shows the thermal resonator (black box) with its radiative cooling fins across the top. The device is filled with a phase-change material that allows it to capture energy from changing temperatures. Other approaches have been used to try to draw power from thermal cycles, with pyroelectric devices, for example, but the new system is the first that can be tuned to respond to specific periods of temperature variations, such as the diurnal cycle, the researchers say. These temperature variations are “untapped energy,” says Cottrill, and could be a complementary energy source in a hybrid system that, by combining multiple pathways for producing power, could keep working even if individual components failed. The research was partly funded by a grant from Saudi Arabia’s King Abdullah University of Science and Technology (KAUST), which hopes to use the system as a way of powering networks of sensors that monitor conditions at oil and gas drilling fields, for example. Such systems could also provide low-power but long-lasting energy sources for landers or rovers exploring remote locations, including other moons and planets, says Volodymyr Koman, an MIT postdoc and co-author of the new study. For such uses, much of the system could be made from local materials rather than having to be premade, he says. The team also included MIT chemical engineering graduate students Albert Tianxiang Liu, Amir Kaplan, and Sayalee Mahajan; visiting scientist Yuichiro Kunai; postdoc Pingwei Liu; and undergraduate Aubrey Toland. It was supported by the Office of Naval Research, KAUST, and the Swiss National Science Foundation. Reprinted with permission of MIT News. I attended a seminar a couple of years ago on energy harvesting. The true magic behind energy harvesting is the advances in semiconductor technology that allows extremely low power operation. This kind of ‘flee power’ wouldn’t have been of much use 20 years ago, but now there are processors that can run on as little as one hundred millivolts at extremely low currents. This approach is ingenious! Are we ready for free energy in our greed based economic system or will this invention like so many before dissipate into the suppressed inventions file? It’s called a wind turbine…. Previous Post 5 Tips To Grow A Ton Of Turmeric In Just 3 Square Feet Of Garden Bed… Next Post Stinging Nettle – The Most Nutritious Plant On Earth?